The Revolution will not be televised...unless you're playing Assassin's Creed 3 on a console hooked up to a television set! Beautiful visuals; Historically relevant missions; The rope dart. Some side quests are too tedious; Takes a long time to get into the main story; Lots of walking around. Playing the new Assassin's Creed game is like turning to a new chapter in a history textbook. We've become Altair and experienced life around the time of the Crusades. We've seen 16th century Italy through the eyes of Ezio Auditore. 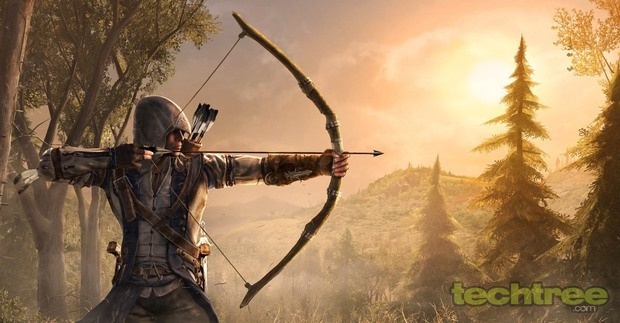 This time around, gamers are thrown in the midst of the American Revolution as the native Indian assassin Ratohnhaké:ton,or his much simpler moniker — Connor. AC3 takes the real world Mayan prophecy of the world ending on 21st December, 2012, and makes the most of it. In the game too, the world is slated to end on this date owing to a massive solar flare. It is up to the Assassins to find the pieces of Eden and save humanity from extinction. Desmond Miles, the constant protagonist across all the AC games takes control of his Native American ancestor Connor, as a group of Templars plot to take over his village. What About The Game World? 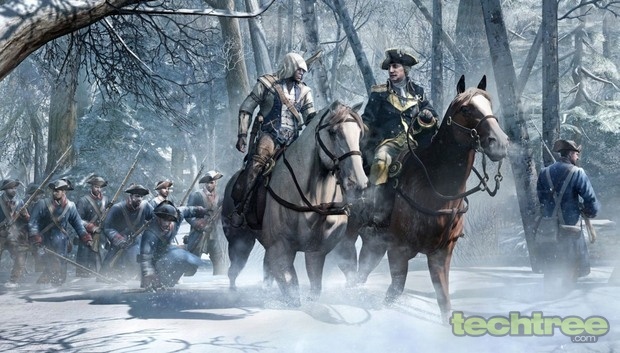 AC3 is set in the British colonies of Boston and New York, and a lot of villages and jungle around. Choosing to undertake the optional naval missions gives you access to the eastern seaboard, and in one mission the Carribean as well. This makes AC3's game world significantly bigger than any of its predecessors. The world is not only huge, but for the first time in the series, you really get to experience it. While the earlier games showcased beautiful versions of Jerusalem, Damascus, Florence, and Venice, you never really discover the potential of a beautiful game world till AC3. The American countryside looks spectacular through summer, winter and autumn and in AC3 it truly becomes an "open world". There's a variety of side missions that take advantage of the surroundings and of the game mechanics. Have some free time while you're in the city? Use your parkour skills to help Benjamin Franklin recover pages of his Almanac that are flying away. Wandering about in the jungle? Why not hunt deer and rabbits while you're at it, and earn some valuable animal skin which you can use in trade! Just because it's a white background and there's an American flag, doesn't mean we're on the moon. Assassin's Creed 3's expansive game world in it's own way is a shortcoming. Sure, there's a lot to do. But after a point all you want to do while playing Assassin's Creed, is assassinate people. A lot of the early sequences in the game are spent tediously teaching you the mechanics of the game — like how to hunt. These missions give you way too many objectives to complete, such as killing animals by using multiple techniques, killing three different types of animals, etc for a very small payoff in the game. There is an entire mission where you take control of a ship, sail it to a port, fit guns to it, and end up engaging in a firefight with enemy frigates. This mission is quite long, and it basically sets up one of the side missions in the game — something that you can easily avoid, thus making the setup level a waste of time. There are far too many small elements introduced in the game, like building homesteads and crafting artefacts for trade. Rescue people from a templar stronghold, and you can use them as allies in your battles. Rescue people in a spot of bother that you may encounter all throughout the world, and they offer you their professional services — including cutting timber and crafting medicine. The more people you help, the more get added to your homestead. This gives rise to a little village. As I said earlier, all this makes the game extremely detailed, but it also serves as a major distraction when it comes to sticking to the main storyline. Thanks to all these needlessly complicated side quests, it takes a good two hours to get anywhere close to the main story, and that's way too long. You really need to power through these opening missions, and even then the game only gets marginally interesting. The real good missions are still a few hours of game time away. A lot of your time is spent running from one place to another. Even after using the fast travel options you will realise that there is a fair bit of running to be done. 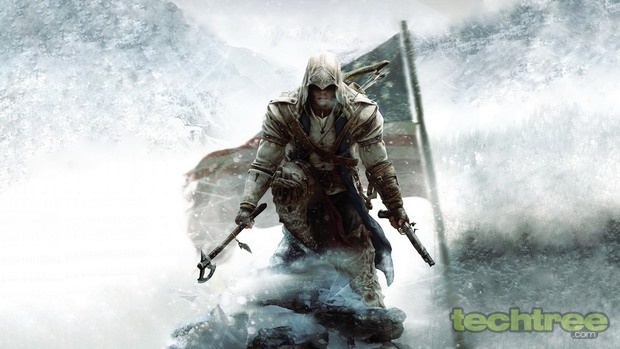 Assassin's Creed 3 is a huge step up from its predecessors, make no mistakes about it. It takes everything that was amazing about the previous games and makes it better, giving you a solid gaming experience. The historical elements that the series is famous for are all there, and you get a superb insight into the American revolution. You interact with a lot of famous real world characters like Benjamin Franklin, Samuel Adams, John Pitcairn, and George Washington, and even get to be a part of history by taking part in events such as the Boston Tea Party. However, all the extra side missions end up being a bit of a hindrance to the game. This is something that should be there in the game for sure, but a little editing to just make it snappier isn't too much to ask for. The game is slow, and it is long enough to give you 20 hours of gameplay, but you need to power through most of it to get any satisfaction.